At this price, no bride can afford to be without her wedding bag. 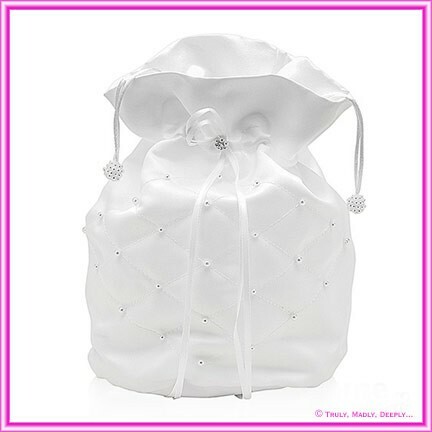 A lovely bag that is perfect for holding the lovely brides lipstick, tissues and maybe a little lucky charm. It feautures cross stitch with pearls. The ends of the drawstrings have little pearl balls. Bag is approx. 15cm in height and comes complete in a clear gift box. Hi Ben, Thank you for that, i received the candles today and they are perfect! Thank you again.